1. Today is the last day of regular classes before final exam week begins at my school. My students will get their huge list of everyone’s Top Ten books read this school year (I’ll share it here later on, too!) and use it to make their own summer reading plans. 2. Look what came in the mail from the fantastic yesterday! 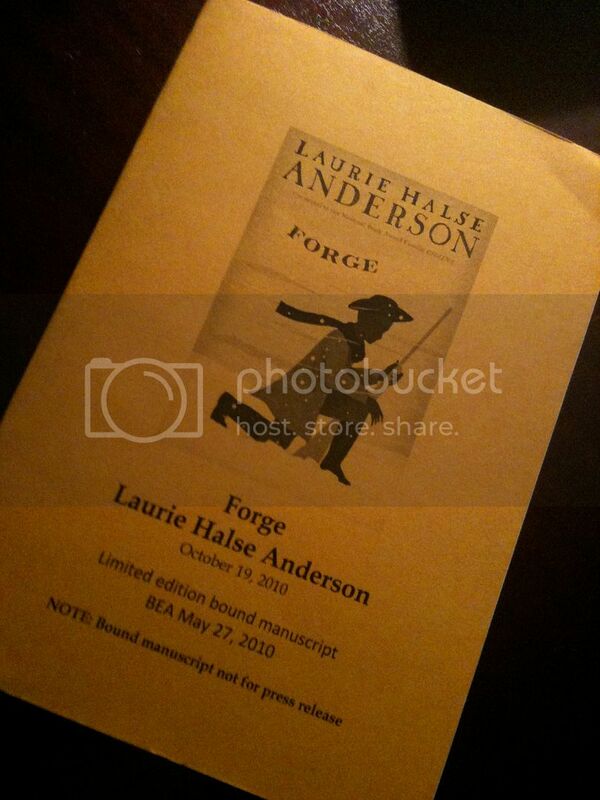 Eric was kind enough to grab me a galley of Laurie Halse Anderson’s FORGE at BEA after I did just the tiniest bit of online whining. My 7th graders read CHAINS together this spring, and tomorrow morning, I’ll share a chapter or two of FORGE aloud before we have our "final exam week activity," a Skype visit with . Don’t you think that’s better than another test? 3. Last night, I hit the 50,000-word mark on my new book, the Upper Middle Grade Dystopian Weather Novel, or UMGDyWN for short (That’s pronounced UM-Goody-Win, in case you’re wondering). Originally, I thought I’d be typing "The End" at 50K, but…um…no. Another five chapters ought to do it, though, so there is light at the end of the drafting tunnel, and there was some quiet happy-dancing on the sunporch when I hit that little milestone at around midnight. 2:30-3:30 – Signing THE BRILLIANT FALL OF GIANNA Z. and ARCs of SUGAR AND ICE at the Walker/Bloomsbury booth. Sunday morning, we’ll be attending the Scholastic Literary Brunch (I’m so excited I’ll get to hear read from her wonderful, wonderful book TOUCH BLUE!) and then that night, I’m joining the Walker/Bloomsbury folks for the Newbery/Caldecott banquet. On Monday, we’ll have a few more hours to explore before it’s time to head home and get ready for our family Fourth of July celebration on the lake. Will I see you at ALA? And either way, what are you thankful for this week?